It’s not easy to find innovation in mints nowadays. How many different round mints in rectangular tins can the market sustain, really? That’s why I was so pleased to stumble on the “Great Bite” product line. They have some of the coolest packaging and product shapes I’ve come across in a while. The tins, the round sour packs, the Tic-Tac-like packs – all have a “bite” taken out of them and so do the candies themselves. The mint tins are your typical Altoids tin shape and size, but the top left portion of the tin is bitten off. Each mint inside is about the size of a Life Saver (with no hole) and a portion of the mint is bitten off too. This theme continues across the whole product line. 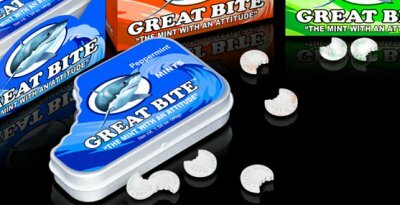 The mints (and tins) come in peppermint, spearmint, and orange and all taste great except the peppermint – it has a strong licorice taste to it that even my seven year old daughter picked up on (which isn’t good if you dislike the flavor of licorice). The orange was especially tasty and hits you immediately with a strong orange kick. The Citrus Sours and Fruit Sours remind me a lot of the Life Savers Fruit Tarts but these aren’t quite as tart but are really good and flavorful. The citrus pack has grapefruit (wow it’s grapefruity), orange, and lemon and the Fruit Sours pack contains grape, strawberry, green apple, and cherry. The Tic Tac-like mints come in peppermint, orange, and spearmint flavors/packs. Again, the peppermint has a strong licorice taste which is a big turn-off to me since I despise black licorice. Neither my daughter nor I could finish one and we both spit it out because of the licorice flavor. The spearmint has an odd, slightly unpleasant taste to it once you get past the outer shell. I’m not sure what that is exactly but I didn’t like it. The orange is good, though not extraordinary and has no hidden surprises. They’re hard to miss with the big shark bite taken out of the packaging, and most are pretty good, but I’d steer clear of the peppermint if you don’t like the taste of licorice (or conversely, pick some up if you do). If you had to pick just one of these to try, my recommendation is the sours. If you’re like me though, you’ll want to pick up one of each just to collect the unique containers. Look for Great Bite products in stores soon. Dang, these are cute. Great packaging idea, too. The slightly different shape would make them stand out among the rest of the candies. I know that if I saw them, I’d totally buy a package just because of that… giggle about it a bit… and probably remember it too. I live in Florida, and the only place they actually sell them is Goodwill…surprising huh? I FINALLY found some of these yesterday! I managed to snag one of each of the tins in peppermint, spearmint, and orange. First, the peppermint: At first I was very confused. It had been a long time coming finding these, and had forgotten all about your mention of the licorice notes. When I opened these (first, I might add :P) I instantly smelled very strong peppermint. My husband, son and I all popped one in our mouths after admiring the clever bitten-mint design, and though we agreed they were very strong, they were also DELICIOUS. However, five minutes later, my purse smelled oddly of licorice, and even my dear husband smelled it over the minty goodness (and immediately assumed I had purchased black licorice and wasn’t planning to share, I might add!). After sniffing our way around we discovered the culprit was the mint tin staring at us the whole time. After trying another mint, we both agreed that other than the smell, there was not a taste of licorice to it that we could detect. (meanwhile my son was rambling on about how cool the shark bites were, not caring whether they tasted like licorice or not!). Next, the spearmint: These we noticed immediately didn’t have nearly as strong of an odor to them licorice, mint, or otherwise. They did smell, well… sweet, actually. All three of us popped one in our mouths and agreed immediately: these were awesome. They definitely don’t have as overpowering of a ‘breath freshener’ quality to them, but they were a nice airy and lightly sweet mint, just perfect. We could have eaten the whole box before we got home if we tried. Really. Then, as hubby and I finished up our spearmint variety, the five year old had crunched his way through his and wanted what he was sure would be his favorite, the orange. I obliged, and opened the tin. Whoa, those smelled fruity! I resisted the urge to tell my child that I’d changed my mind, and hide them to devour myself, and passed one back to him. He put it in his mouth, sucked for a second or two, and spit it across the car. Now, in all fairness, I NOW understand why, and it has NOTHING to do with the flavor of these divine mints. After washing his mouth out with some water and giving his best ‘patooey’s, he explained, the way a five year old only can. He told us it tasted like ‘breakfast and toothpaste’. As I’m a curious creature by nature, I took this as a challenge and popped one in my mouth. I should have listened better, or something. After the two mint flavored mints, the orange one tasted like I brushed my teeth, barely rinsed, then ran into the kitchen and started chugging straight from the orange juice carton. I resisted the urge to spit it out, and instead waited for that awful taste to pass. Well, it did. And I must say, these were only a very close second favorite to the spearmint, provided you don’t eat the spearmint one (or the peppermint, for that matter) first. It tasted like a fresh, juicy orange, right in my mouth. Slightly tart, a little acidic, but totally fresh. Clean and citrus-y and everything great about oranges was right there in a cute little shark-bitten morsel. Buy lots of these. TONS. And never, ever eat the minty ones first and the orange ones last. Unless you happen to enjoy drinking OJ straight after brushing your teeth. Oh, and for those still trying to find these, I found them in the candy Eden that is Walgreen’s. A buck a piece, actually. I should really go buy more while I’m thinking about it…. I definitely noticed the licorice taste. I just was told at my local Walgreens the Great Bite mints were discontinued. So, now I’m digging around online. It appears the same mint is available in orange and wintergreen flavors. Tins of mints are also produced. I do want to know where I can get more of these mints. Who’s got a source they would like to share? Recommend another store? Any help would be appreciated. I am lost – have exhausted the Walgreens in my area/. Tried Dollar Tree and Fred’s to no avail. Can I purchase a case of the peppermint? The Ferrara Pan Candy Company has purchased the rights to this candy. This candy was made in China and they have sold to a US company. You can buy them, but they are more expensive now. Though the packs are 1oz instead of .5oz, they are over $9.00 for a pack of 12 packs, but they want nearly $10 to ship them…I am in WA State. I live in FL and have always bought them at Walgreen’s. They stopped selling them in the stores near me. We were traveling to west coast and deliberately stopped at a Walgreen’s to get the mints and they were on sale for .25 for package of 4. We bought them out but of course, they are all gone now and we can’t find them anywhere. Read they were bought out by a company in Ill. Hope they distribute them again in this area but I am sure they will not be as cheap or packaged the same way. I found these in all 3 flavors at Big Lots in Georgia, we bought them out of our 3 local stores in September 2011 and they have not gotten any more in.